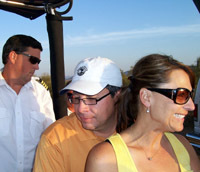 On Tuesday, May 30, 2006, Larry James received a phone call from Sherry Kane, Concierge at The Boulders Resort in Scottsdale. She asked if he could keep a secret. 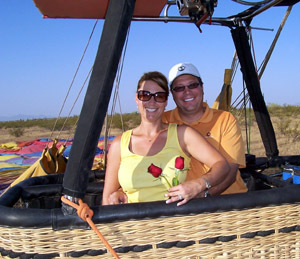 A couple were flying in from Las Vegas to celebrate their 18th wedding anniversary at The Boulders. Rodney had asked her to arrange a hot air balloon ride and to find someone to perform a renewal of vows ceremony while airborne as a surprise to his wife. Larry was to dress casual - as a passenger - and when Rodney gave him the que, he was to surprise Natalie with the special ceremony. 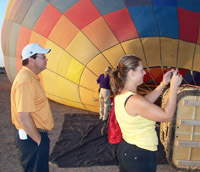 We all arrived at the Sonoran desert launch site at about 5:00 a.m.
Natalie and Rodney watch as the crew prepare to launch the balloon. Natalie was unaware that Larry was taking pictures. All flights begin with the inflation of the balloon by motorized fans. Just before lift off at approximately 5:30 a.m. Larry James, Rollie (the Captain), Rodney & Natalie McKimmey are ready to go as Carl (Director of Operations at Hot Air Expeditions) and Crew Chief Rob look on. 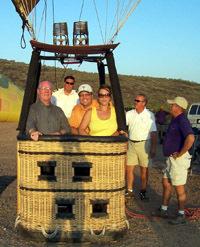 Captain Rollie prepares to give the balloon lift by heating the air inside the balloon as Rodney and Natalie prepare for their adventure. 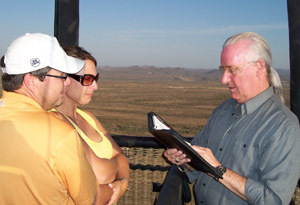 At about 4,100 feet over the Phoenix area, with their backs to Larry, Rodney gave Natalie a hug, gently held her close and said, "Would you marry me all over again?" Natalie smiled and said, "In a hot air balloon?" Rodney said, "Yes." Without knowing that she was about to be surprised with a wedding vows renewal ceremony, she quickly replied, "I'd marry you again in a heartbeat!" Captain Rollie handed Larry his notes as Rodney gently turned her around to face Larry and said, "Then let's do it right now!" The look on Natalie's face was priceless! She was totally surprised to see Larry facing them ready to do the ceremony. Larry begins the vows renewal ceremony as Natalie tries to hold back the tears. Natalie listens as Rodney reads a list of meaningful moments in their marriage, including their three wonderful children, Jackcord, Zachery and Victoria. 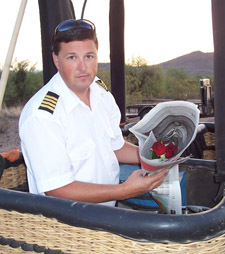 Captain Rollie hid two red rose buds on his side of the balloon to be presented to Natalie and Rodney during the ceremony. 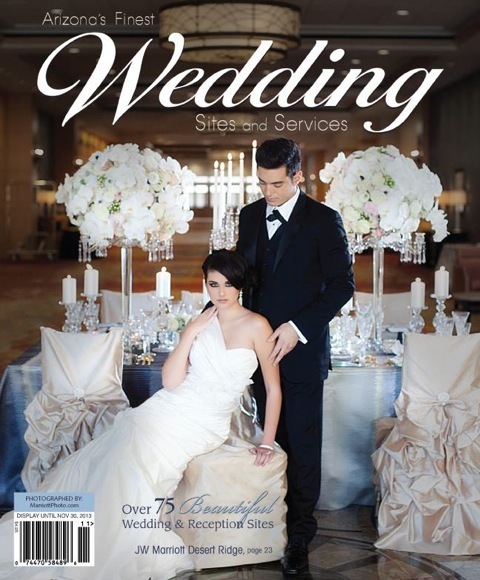 "You may now renew your marriage vows with a kiss!" Happy together, and ready to go for another 18 years! During the flight we had an unobstructed 360-degree view of the Valley of the Sun. The balloon is on the ground and we had a safe landing. 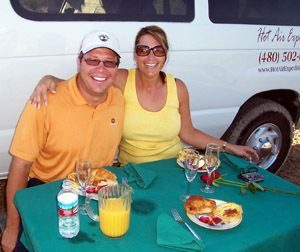 Hot Air Expeditions prepared a champagne breakfast with scrumptuously prepared gourmet food for the happy couple and they invited Larry James to join them. What a way to celebrate 18 wonderful years together! 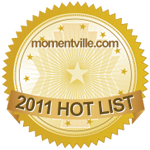 Call Larry James (480-998-9411) for complete details of how to surprise your sweetheart!